Galway Metals Intersects Wide, High-Grade, VMS Mineralization in Gap Area at its Estrades Project in Quebec - Galway Metals Inc.
(Toronto, Ontario, July 26, 2018) – Galway Metals Inc. (TSX-V: GWM) (the “Company” or “Galway”) is pleased to report assay results from 10 additional drill holes plus two extensions (7,224 metres) at its former producing, 100%-owned, 20,915 hectare, Estrades polymetallic property located in the northern Abitibi of western Quebec, Canada. 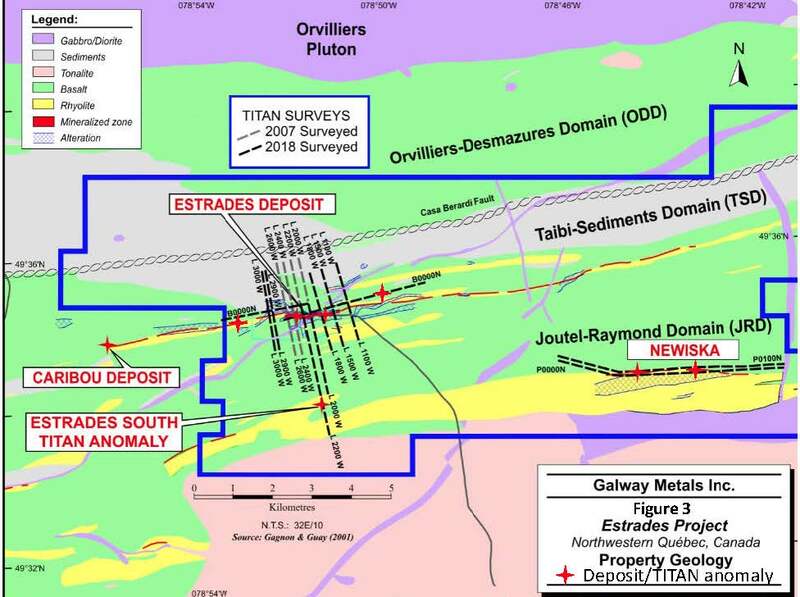 This brings Galway’s total drill results reported to date at Estrades to 20,707 metres in 34 holes (plus 3 stopped due to deviation) plus three wedges (in addition to 501 m in one hole at Newiska; 2,191 m in five holes at Newiska are pending); a total of approximately 200,000 metres have been drilled on Galway’s Estrades property since discovery in the 1970’s. The drill program was designed to expand the existing resource on the periphery of known zones at shallow depths, and to probe deeper holes close to potential high-grade hydrothermal source vents. “We are pleased that our drilling of the gap area immediately east of the cross fault and ramp continues to yield strong gold, silver and zinc mineralization over wide widths. This drilling continues to confirm expectations as indicated by the Titan geophysical anomaly in this area. We are looking forward to incorporating these and other drill results in the pending Estrades resource update, which will be out in the third quarter” cites Robert Hinchcliffe, President and CEO of Galway Metals. 4.3 g/t Au, 115.2 g/t Ag, 11.0% Zn, 0.8% Cu and 0.9% Pb over 7.1 m (5.2 m true width (TW)) at a vertical depth of 288 m below surface, (including 6.0 g/t Au, 212.5 g/t Ag, 16.2% Zn, 0.6% Cu and 1.8% Pb over 2.85 m), in GWM-18E-48. 3.0 g/t Au, 176.0 g/t Ag, 17.9% Zn, 0.3% Cu and 0.9% Pb over 5.4 m (3.4 mTW) at a vertical depth of 456 m below surface, in GWM-18E-32. 1.3 g/t Au, 88.1 g/t Ag, 6.5% Zn, 0.7% Cu and 0.3% Pb over 4.8 m (3.3 m TW) at a vertical depth of 321 m below surface, (including 1.7 g/t Au, 95.0 g/t Ag, 14.5% Zn, 0.5% Cu and 0.8% Pb over 2.0 m), plus 0.6 g/t Au, 74.5 g/t Ag, 3.0% Zn and 4.1% Cu over 1.0 m (0.7 m TW) in GWM-18E-42. 1.5 g/t Au, 40.0 g/t Ag and 3.9% Zn over 6.8 m (5.1 m TW) at a vertical depth of 286 m below surface, (including 1.8 g/t Au, 35.3 g/t Ag and 4.8% Zn over 4.7 m (3.5 m TW) in Hole GWM-18E-43. 15.7 g/t Ag and 2.2% Cu over 1.9 m (0.9m TW) at a vertical depth of 531 m below surface, (including 4.4% Cu over 0.6 m (0.3m TW), plus 37.9 g/t Ag, 0.3% Zn and 2.9% Cu over 0.8 m (0.4m TW), plus 22.3 g/t Ag and 1.9% Cu over 0.5 m (0.2m TW) in GWM-18E-46B. 1.0 g/t Au, 11.9 g/t Ag and 2.2% Cu over 1.8 m (0.9 m TW) at a vertical depth of 419 m below surface, (including 2.2 g/t Au, 18.5 g/t Ag and 4.7% Cu over 0.6 m), plus 0.5 g/t Au, 64.8 g/t Ag and 3.6% Cu over 0.8 m (0.4 m TW) in GWM-18E-18. Notes: Holes were not drilled in sequential numerical order. Holes GWM-17E-20, 22, 33-40, and 44 were not drilled; holes 23, 25 and 26 were stopped short of target. Initial attempts at drilling holes 21 and 46 equaled 792m, and were stopped due to excessive deviation. The four Galway holes in the area just east of the cross fault and ramp are all high-grade and represent what is likely to be a significant extension to the current resource, which will be updated in coming weeks (see below). The TITAN geophysical survey undertaken by Quantec Geoscience for Galway appears to indicate that this new zone is continuous to depths greater than 2,000 metres on three lines covering 400 metres of strike length (Figure 2). 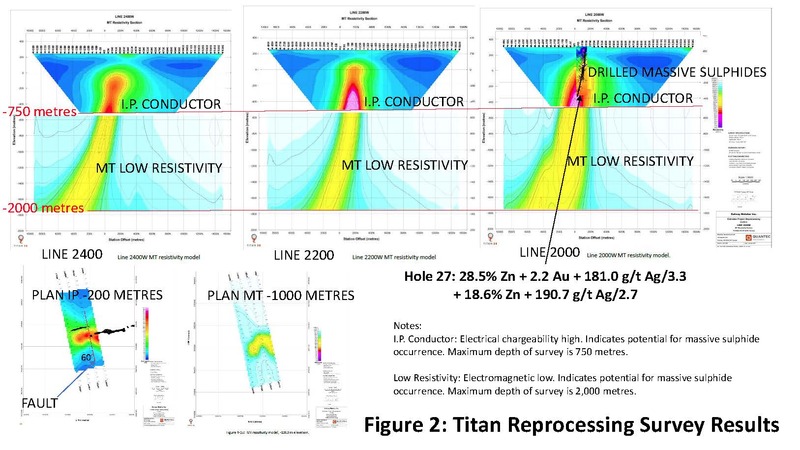 These results are within the chargeability high and resistivity low anomaly identified by the Titan survey. The MT-referenced IP chargeability models show clear high responses to their maximum depths of 750 m, while the MT-referenced EM resistivity models show clear low responses as continuous structures to depths greater than 2,000 m. As expected, the IP high and EM low responses are spatially coincident with each other. Drilling has been stopped since the end of April (end of the winter drilling season). Future plans are to drill the area above hole 48 this coming winter. “We believe the new area will make the economics of the deposit far more enticing because this large area of wide, high grade mineralization would be the first zone encountered if development from the existing ramp were to take place going east. 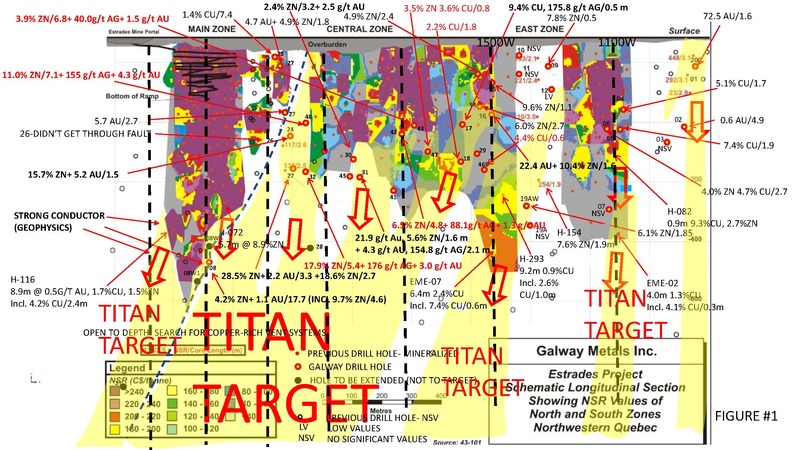 A gravity survey to be completed in the next couple of months should augment the TITAN survey which has identified numerous strong anomalies on the property (Figure 3)” cites Mike Sutton, VP Exploration of Galway Metals. Results from hole 48 of 7.1 metres grading 11.0% Zn, 4.3 g/t Au, 115.2 g/t Ag, extends toward surface the previously intersected high-grade mineralization (holes 27 and 24) that exists immediately east of the cross fault and ramp and remains open for 236 metres above (Figure 1). This drill hole extended mineralization 45 m above, and 58 m east of hole 24, which returned 5.2 g/t Au, 198.7 g/t Ag and 15.7% Zn over 1.5 m, and 158 m above hole 27, which returned 2.2 g/t Au, 181.0 g/t Ag and 28.5% Zn over 3.3 m, plus 190.7 g/t Ag and 18.6% Zn over 2.6 m at vertical depths of 435 metres and 453 metres, respectively. None of these holes are in the current resource estimate and remain open above and below. Results from the extension of hole 32, which returned 5.4 metres grading 17.9% Zn, 3.0 g/t Au and 176.0 g/t Ag, extends to the east and to depth previously intersected high-grade mineralization. The zone remains open below this hole and the strong mineralization encountered in hole 27. This drill hole extended hole 27 mineralization 49 m to the east (and 12m below), and is 111 m below hole 24, and 158 m below hole 48, Together, these drill results represent a strong vertical corridor of high-grade mineralization that coincides with the Titan IP and EM anomaly that measures 400 metres along strike and at least 2,000 metres deep. These drill intersects will, for the first time, be incorporated in the pending resource update, and remains open to surface and to depth. Holes 41, 42, 43 and 45 add mineralization to the central part of the Central Zone either in areas that were previously believed to be waste or down dip from the existing resource, and they remain open below. The intersections in hole 42 (1.3 g/t Au, 88.1 g/t Ag, 6.5% Zn, 0.7% Cu and 0.3% Pb over 4.8 m) exist in a necked down narrow portion of the resource (it was drilled in an area that was previously thought to contain below cutoff grade mineralization) and is located 50 m west of hole 43 (1.5 g/t Au, 40.0 g/t Ag and 3.9% Zn over 6.8 m) and 188 m above hole 41 (1.9 g/t Au, 13.9 g/t Ag and 5.3% Zn over 0.7 m). The intersection in hole 43 exists 35 m from the closest resource hole in this area and would extend the resource into an area previously thought to be barren. None of these holes are in the current resource estimate. Holes 18, 29, 46B and 47 were drilled to extend high grade copper shoots on the eastern side of the Central Zone that were in areas previously believed to be waste. Hole 46B (15.7 g/t Ag and 2.2% Cu over 1.9 m) extends mineralization 35m from the mineralization encountered in hole 29 (37.3 g/t Ag and 1.3 Zn over 2.0 m) and 217 m below previously released hole 16 (22.4 g/t Au, 199.3 g/t Ag, 10.4% Zn and 2.0% Pb over 1.6 m), and is also not in the resource. Hole 46B is 296 m vertically below the closest resource hole in this area. Hole 18 (1.0 g/t Au, 11.9 g/t Ag and 2.2% Cu over 1.8 m) extends mineralization 123 m below previously released hole 17 (0.2 g/t Au, 76.1 g/t Ag, 0.4% Zn and 3.7% Cu over 1.6 m). Both of these holes, as well as holes 14, 16, 29, 46 and 47, were drilled in an area that was previously believed to be waste. These drill intersections will be incorporated in the pending resource update, and they remain open below. Hole 21, and the extension of hole 28, did not reach their targets; further extensions or wedges will follow after downhole geophysics is undertaken. Hole 21 did intersect extremely altered rhyolite with abundant talc and with an assay of 1.0% Zn over 1.4 m (TW Unknown) at a vertical depth of 1,150 m below surface at the end of the hole. The TITAN survey appears to indicate strongly anomalous geophysical responses in the vicinity of this hole. This is the deepest hole drilled at Estrades. It targeted the down-plunge extension of the Main Estrades deposit below the bottom of the current resource. Before extending or wedging this hole, downhole geophysics will take place to see if the Main zone extension might be just to the south. The entire 400-metre area of interest beneath the resource can be drilled by wedging off of this hole. 22.4 g/t Au, 199.3 g/t Ag, 10.4% Zn and 2.0% Pb over 1.6 m (0.8m TW), in Hole GWM-17E-16. On August 18, 2016, Galway published a NI 43-101 compliant Estrades resource estimate (Table 1), which included Indicated Resources of 518,000 ounces at 12.4 g/t gold equivalent (or 652,000,000 lbs at 22.8% zinc equivalent), plus Inferred Resources of 290,000 ounces at 7.4 g/t gold equivalent (or 366,000,000 lbs at 13.6% zinc equivalent) (refer to Galway’s website at www.galwaymetalsinc.com for details on the Estrades resource estimate). The Estrades project was previously mined via a 200 metre deep ramp, with production in 1990-91 totaling 174,946 tonnes grading 12.9% Zn, 6.4 g/t Au, 1.1% Cu and 172.3 g/t Ag. Galway is planning to release an updated resource in the third quarter, taking into account new drilling results received since the 2016 resource. *Au (Eq g/t) and Zn (Eq %) represent the in-situ metal content expressed as Au and Zn equivalents. Holes were not drilled in sequential numerical order; holes GWM-17E-20, 22, 33-40, and 44 were not drilled.